But the thing is, to know how to get it better, you need to first understand the pathology. So, here is a simple explanation that will make the fix make a whole lot of sense. 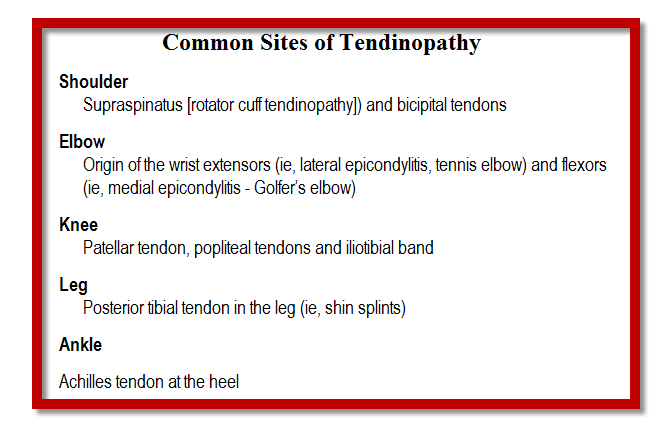 Tendinopathy used to be called tendinitis but they found many years ago that they are not very inflammatory at all. Because of this they took out the “itis” and put in “opathy” which means dysfunction. 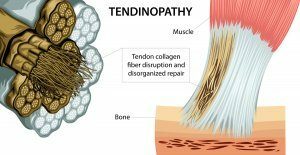 A tendinopathy occurs when the tendon adapts the wrong way to overload. When a tissue is stressed when used a lot it normally adapts and strengthens itself over 72 hours. BUT. If a tendon doesn’t have this amount of time an dis loaded again within that healing/adaptation cycle, you add stress to half-healed stress. Repeat this over and over and eventually, the tissue thickens and becomes a tendinopathy. This is referred to as a tendinosis on scan results. So, why is my tendon now healing? The reason it hurts is that the fiber make-up in the tendon has changed. Resting the tendon, using painkillers or getting a cortisone injection may ease the pain – but it will not force a change to the tendon fibers. It won’t get rid of the dysfunction that developed from the initial overload. There is strong evidence that tendons are highly responsive to loading exercises. However, they have to be loaded the right way with the right magnitude. Load the tendon the right way and follow your physios advice. Passive treatment does not work well in the long term and you do need to stick with the active rehab exercises – there is no “quick fix”.